Although organic radicals are generally transient, some are quite long-lived. Generally organic radicals are stabilized by any or all of these factors: presence of electron-withdrawing groups, delocalization, and steric protection. The compound 2,2,6,6-tetramethylpiperidinyloxyl illustrates the combination of all three factors. It is a commercially available solid that, aside from being magnetic, behaves like a normal organic compound. The stability of many (or most) organic radicals is not indicated by their isolability but is manifested in their ability to function as donors of H.. This property reflects a weakened bond to hydrogen, usually O-H but sometimes N-H or C-H. This behavior is important because these H. donors serve as antioxidants in biology and in commerce. Illustrative is α-tocopherol (vitamin E). The tocopherol radical itself is insufficiently stable for isolation, but the parent molecule is a highly effective H-atom donor. The C-H bond is weakened in triphenylmethyl (trityl) derivatives. 2,2,6,6-Tetramethylpiperidinyloxyl is an example of a robust organic radical. The inorganic compound nitric oxide (NO) is a stable radicals. Fremy's salt (Potassium nitrosodisulfonate, (KSO3)2NO·) is a related example. There are also hundreds of examples of thiazyl radicals, despite limited extent of π resonance stabilization. Radicals form by breaking of covalent bonds by homolysis. The homolytic bond dissociation energies, usually abbreviated as "ΔH °" are a measure of bond strength. Splitting H2 into 2H•, for example, requires a ΔH ° of +435 kJ·mol-1, while splitting Cl2 into 2Cl• requires a ΔH ° of +243 kJ·mol-1. For weak bonds, homolysis can be induced thermally. Strong bonds require high energy photons or even flames to induce homolysis. Diradicals are molecules containing two radical centers. Dioxygen (O2) is the premier example of a stable diradical. Singlet oxygen, the lowest-energy non-radical state of dioxygen, is less stable than the diradical due to Hund's rule of maximum multiplicity. 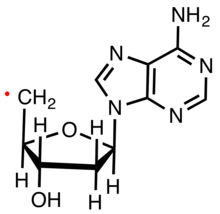 The relative stability of the oxygen diradical is primarily due to the spin-forbidden nature of the triplet-singlet transition required for it to grab electrons, i.e., "oxidize". The diradical state of oxygen also results in its paramagnetic character, which is demonstrated by its attraction to an external magnet. Diradicals can also occur in metal-oxo complexes, lending themselves for studies of spin forbidden reactions in transition metal chemistry. Carbenes in their triplet state can be viewed as diradicals centred on the same atom, while these are usually highly reactive persistent carbenes are known, with N-heterocyclic carbenes being the most common example. Triplet carbenes and nitrenes are diradicals. Their chemical properties are distinct from the properties of their singlet analogues. Many polymerization reactions are initiated by radicals. Polymerization involves an initial radical adding to non-radical (usually an alkene) to give new radicals. This process is the basis of the radical chain reaction. The art of polymerization entails the method by which the initiating radical is introduced. Newer radical polymerization methods are known as living radical polymerization. Variants include reversible addition-fragmentation chain transfer (RAFT) and atom transfer radical polymerization (ATRP). Radical intermediates in the formation of polymethacrylate (plexiglas or perspex). Being a prevalent radical, O2 reacts with many organic compounds to generate radicals together with the hydroperoxide radical. Drying oils and alkyd paints harden due to radical crosslinking initiated by oxygen from the atmosphere. An approximate structure of lignin, which constitutes about 30% of plant matter. It is formed by radical reactions. Radicals typically exhibit paramagnetism. Electron spin resonance is a the definitive and widely used technique for characterizing radicals. The nature of the atom bearing the unpaired electron and its neighboring atoms can often be deduced by the EPR spectrum. This page was last edited on 21 April 2019, at 12:42 (UTC).